Diane Mitton Mountains have always presented a challenge to the imagination of men. They create in our mind a sense of awe, of fear, of majesty, a desire to know what is o n the other side and for some, a need to conquer. In response to the question why do men climb mountains, someone is said to have replied , ‘ because they are there’. In other words, it’s a challenge - and we cannot resist the call. Add weather as an ingredient to the lure of the challenge presented by the mountain itself and you have a real contest! The White Mountains of New Hampshire may seem insignificant in comparison to the great mountain peaks of the Rockies, the Andes and the Himalayas - they have however, the well-earned reputation of having some of the most severe and unpredictable weather conditions in the world. A fact which has not deterred men, nor women, from accepting the challenge, but rather has increased the desire to become part of a select group of climbers who have conquered the mountain under sometimes extremely difficult conditions. The first known ascent of Mount Washington by white women was accomplished by the three Misses Austin in 1821 and Lucy Crawford, in her book “History of the White Mountains” tells of accompanying a party of women to the summit in 1825. Climbing the Presidentials and the Franconians quickly became a goal for hikers and eventually led to the overuse of their trails. In 1957, the Four Thousand Footer Club was formed to introduce hikers to those areas of the Whites, as they are affectionately called, which were less well known. Peaks such as Hancock, Owl’s Nest and West Bond had no trails and were rarely climbed. The White Mountains have 48 mountains over 4000 feet ranging from Tecumseh, 4300’ to the granddaddy of them all, Washington at 6288’. There are six peaks in the 5000 +/- group. The Appalachian Mountain Club recognizes in addition to New Hampshire’s 48-4000 footers, a list of the New England Four Thousand Footers and the New England Hundred Highest . 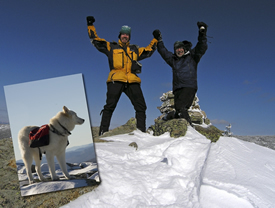 On March 17, 2005 Gordon DuBois of New Hampton and Bob Manley, a professional photographer from Sanbornton successfully climbed West Bond, the last in their quest to climb New Hampshire’s four thousand footers in the winter. By doing so, they became members of an elite group, the Winter Four Thousand Footer Club, bringing the number of hikers who had ascended all of the 48 peaks in the winter to 325 by the end of the winter climbing season of 2005. To qualify, the start and finish of the hike must take place between the official winter solstice and the spring equinox, late December to the middle of March. The earliest known climbers to accomplish this feat were Bob and Mariam Underhill in 1961. Gordon and Bob started their adventure together in February of 2001, an adventure which they pursued for the next five winters. Gordon and Bob (and Bob’s dog Noah) have developed a passion for winter climbing. Their next quest will earn them membership in an even smaller group, the New England Hundred Highest which according to the AMC has only 73 members. However, both men point out that it is the “pleasure of being out there and experiencing the mountains which is the real goal” and that completing a specific number is only a consequence. Bob says that it is a “strange and wonderful world atop the White Mountains in the winter” a world which he has documented by thousands of photographs. For those who can’t be there to appreciate it in person, he hopes some day to create a book using notes from his journals and some of these photographs. Gordon’s, plans included hiking the Long Trail starting in October after retiringin September from the NH Department of health and Human Resources. In March of 2007, he will begin a through hike of the 2160 mile Appalachian Trail, a foot trail running from Maine’s Mt. Katahden to Springer Mountain in Georgia. On Monday evening, May 1, Gordon DuBois will recount the four year quest of he and his hiking partner, Bob Manley to reach the summits of New Hampshire’s 48-4000 footers in the winter at a program offered by the Thompson-Ames Historical Society of Gilford. His presentation will focus on the history of winter mountaineering in the White Mountains. Spectacular photography will be used to enhance appreciation for a feat that few have experienced in person. The program will be held at the Society’s Meetinghouse, 24 Belknap Mt. Road in Gilford Village beginning at 7:30 p.m. following a short business meeting at 7:00. Refreshments will be served and the speaker will be available for question after the program. For further information about Thompson-Ames Historical Society’s programs, please call 527-9009.